Behind the scenes at the moment we’re tinkering away with the Google Analytics settings at the moment (there’s been a rather strange and unexplained series of drops in our hits which we’re investigating). One of the things we’re going to need to look at is the impact over time of some tweeks we’re making to the code that supplies the data to Google. As a result I found myself this morning taking a look at the same three month period over the past 4/5 years – as charted below. Apologies for not being able to make the Y-axis the same maximum value (suspect it’s an option if I wasn’t running GA in IE7…). The way this year and last seem to trend is as expected a reduction in hits over the summer, and I was just about to declare this a regular trend when I spotted that actually in 2009 & 08 this doesn’t seem to be as true. I have no explanation whatsoever for this trend – but I wondered if any other repository managers out there have the same sort of data they might be willing to share or comment on the above. Do your hits lose their vitality over the summer months, or are they just as potent as ever? The only big changes I can point to on the LRA are an expansion from ~3,000 records in ’08 to ~7,300 currently; and a shift from <25% full text in ’08 to currently 50% full text as of today (although by the end of August this proportion will plummet as we expand the records on LRA by about 15,000 metadata only records). This entry was posted on 26 July, 2012 at 9:00 am	and is filed under Leicester Research Archive. Tagged: hits, repositories, statistics, trends. You can follow any responses to this entry through the RSS 2.0 feed. You can skip to the end and leave a response. Pinging is currently not allowed. We’ve always seen a bit of a dip for June/July (other that 2008 but we only launched in July that year). Our visitor stats always run somewhat parallel to the academic year, peaking in Spring (Mar-May depending on the year) and in Oct/Nov and downloads of the full text items show the same pattern. Visitors have also consistently grown year on year, with this year being the best yet, seeing more than 2000 visits a day at the peak. As you say it would be an interesting study and interesting to see if other repositories follow either pattern. Hi Yvonne, thanks for the comment. We actually launched in 2006 so the stats do go back further; but I thought a 5 year window was enough for the above quick and dirty analysis. My inner stats geek is slightly horrified by the number of compromises I’ve had to include in the analysis and is screaming about a lack of a “control” period. 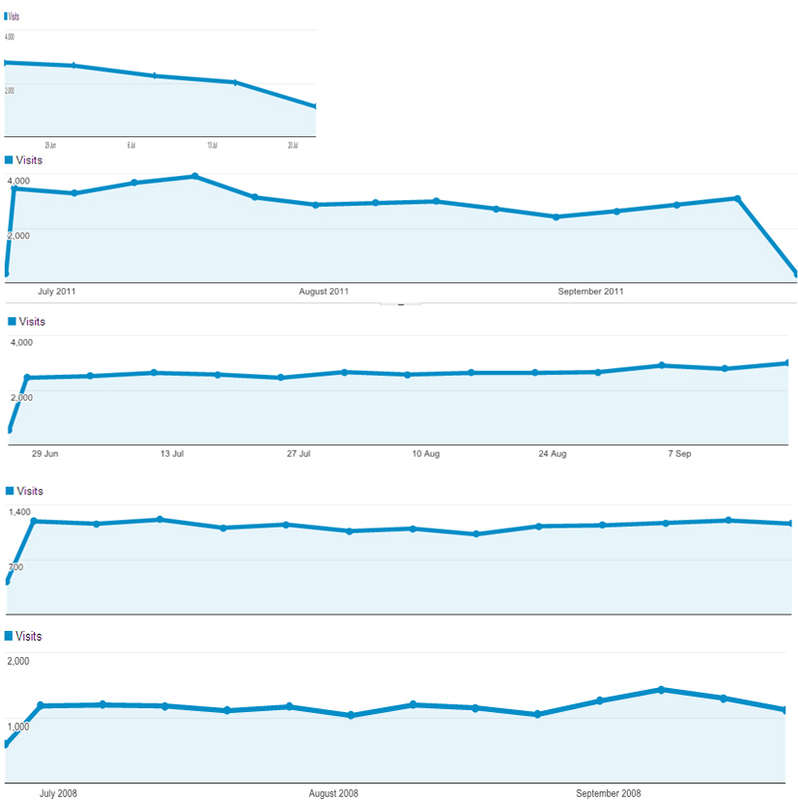 Good to see that like us (until May) that you were climbing year on year, and I’m quite envious by your daily visits (for 2011 on average we had 323 visits a day – which is okay but hardly stellar). I am going to be very interested if IRUS turns up any interesting data in this area (given we’re one of the pilot sites); and I do firmly believe that more transparency of repository stats would be useful to me as a manager for comparing. Although at the back of my head I’m concerned if we see unwarranted “competition” between repositories – the SCONUL stats return for example seems to support this. Healthy competition is good, but the hits depend as much on the repo architecture at the end of the day as the quality and quantity of research within the repository. Can’t get the hits if I can’t get the deposits (and we’re only around 20% of current output like a lot of places). I agree and maintain that SCONUL is asking the wrong questions if they actually want any meaningful comparison (but I don’t thinks that true of just repositories). The UK’s repository environment is too diverse to try a like for like comparison and as you say a lot of the traffic comes from some very fuzzy areas that aren’t necessarily under our control. I’ll look forward to seeing the results of the IRUS pilot as well! SCONUL do love a metric, which is odd with so many Social Science/Arts peoples as librarians you’d think they’d be happier working with qualitative measures. I mean, as a former life-scientist even I know there are times when exact figures just aren’t a strong indication of what’s going on. Makes me wonder if the whole world’s just going metric crazy sometimes.